The Center for Race and Gender (CRG) announces the availability of grants for undergraduate and graduate students to support research or creative projects that explore issues related to race and gender. The Center for Race & Gender welcomes proposals from undergraduate students to support research or creative projects. Project topics should be consonant with CRG’s mandate to support critical student research on race, gender, and their intersections in a wide variety of social, cultural, and institutional contexts, especially on the Berkeley campus and its neighboring communities, but also in California, the nation, or the world. Proposals that address both race and gender will be prioritized, and proposals that do not address race at all will be de-prioritized. Projects may be oriented toward academic research or may approach race and gender issues from the perspectives of the media, fine arts, and performing arts. ELIGIBILITY: Applications can be submitted by any student enrolled in a undergraduate program at UC. Berkeley. Proposals that support research for a thesis project are strongly encouraged. CRG will only give grants on a one-time basis. Previously grantees will not be considered. GUIDELINES: Grants are intended to fund students’ own independent research, rather than contributory research for a broader faculty project. We encourage students to include a specific research question that they hope to answer in their proposals. For creative projects, we ask students to include a thesis statement for their project and a critical race and/or gender analysis for why the project is important. Strong proposals will include a critical race and/or gender analysis. We recommend sending a draft of your proposal to your faculty mentor with enough time to incorporate their feedback. GRANT PERIOD AND USE OF FUNDS: Grants will be awarded for a period of six months (schedule details are shared in the grant award letter). Grant payments will be in the form of reimbursements for expenses. Funds may be used for direct costs related to the proposed project, such as travel to archival or ethnographic research sites; books and supplies; equipment rental; or token gifts or gift cards for research subjects. Funds may not be used for equipment purchase, personal stipend, living expenses, conference attendance, educational travel, third-party payments to individuals (e.g. research subjects, assistants, or consultants), or transcription services (unless needed for disability access). GRANTEE REPORTING: Grant recipients are required to submit a final report within two weeks of the end of the grant period containing: 1) an itemized expense report and 2) a statement of what was accomplished. 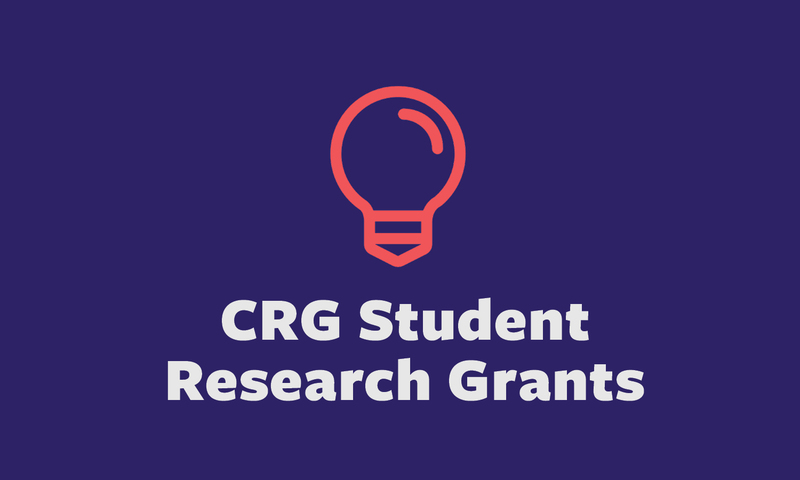 Grant recipients may be asked to present their projects at a CRG Forum and their project description may appear on CRG’s website and any publications. Please see below for links to form submissions. If you do not receive confirmation of receipt within one week of sending your proposal, please inquire with the CRG staff at rng2@berkeley.edu. Incomplete applications will not be considered. Awards will be announced within three weeks of the deadline. INQUIRIES: Direct inquires to rng2@berkeley.edu. CRG will only give grants on a one-time basis. Previously grantees will not be considered. If you received a grant as an undergraduate, you are eligible to apply for a graduate grant with CRG. GRANT PERIOD AND USE OF FUNDS: Grants will be awarded for a one year period (schedule details are shared in the grant award letter). Grant payments will be in the form of reimbursements for expenses. If working with human subjects, please provide Committee on the Protection of Human Subjects approval or exemption letter. If CPHS has not sent notification by date of application, indicate date of submission and pending status. Grant funds will be released only after approval or exemption letter is submitted.